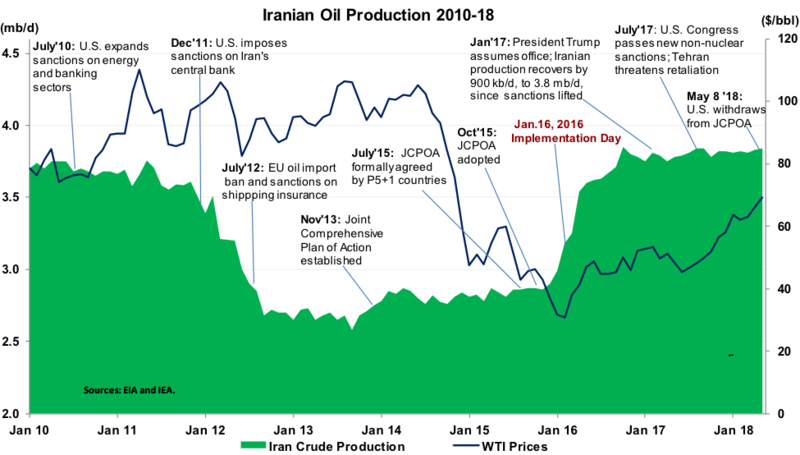 President Donald J. Trump’s decision to exit the Iran nuclear deal and reimpose sanctions has injected a much higher level of volatility into oil markets, with prices scaling new heights to levels not seen since 2014. President Donald J. Trump’s decision to exit the Iran nuclear deal and reimpose sanctions has injected a much higher level of volatility into oil markets, with prices scaling new heights to levels not seen since 2014. In reality, the disruption to Iranian exports and oil trading flows will be relatively limited, but against a backdrop of stronger global oil demand, declining stock levels, and the upcoming peak summer driving and cooling season, markets are unnerved. Equally, the broader implications for escalating regional tensions are expected to inflate the geopolitical price premium in markets going forward. The potential for conflict is squarely on the radar screen of everyone invested in the region, including oil executives. Mindful to avoid blame for higher consumer prices, the Trump administration has reached out to major Gulf Arab oil producers to secure promises from some countries that they will offset any lost Iranian supplies. Saudi Arabia has already pledged to “mitigate the impact of any potential supply shortages,” with Kuwait and the United Arab Emirates also lending their support. In a bid to temper the post-announcement rise in prices, Saudi Minister of Energy, Industry, and Mineral Resources Khalid al-Falih has taken a page from Trump and announced via Twitter that he is “in close contact with OPEC ’s Presidency, Russia and the US, and will be connecting with other producers and major consumers over the next few days to ensure market stability.” U.S. Treasury Secretary Steven Mnuchin said U.S. officials have had conversations with “various parties” that would be willing to increase oil supply to offset any lost Iranian exports. The Treasury and State Departments quickly issued amended guidelines detailing changes to the sanctions regimes. 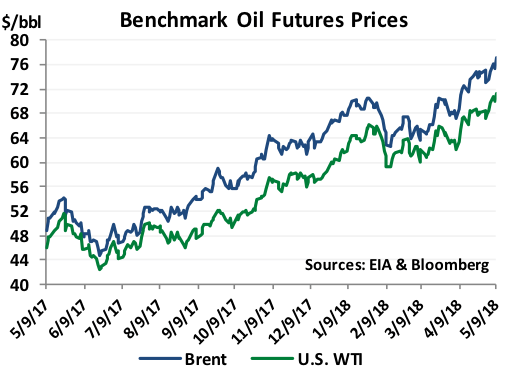 Despite Washington’s efforts to calm oil markets, international benchmark crude futures prices are now trading near four-year highs, with Brent up by a steep $8.50 per barrel (/bbl) over the past month, to just over $77/bbl. Washington has rattled markets by specifically singling out measures to restrict Iranian oil exports. There is a 180-day period for companies that choose to adhere to reimposition of U.S. sanctions on the oil and banking sectors to unwind contracts, which should lessen the impact on global supplies. The reinstatement of U.S. energy sanctions is expected to reduce Iran’s 2.5 million barrels per day (mb/d) of exports by a relatively modest 300,000 to 600,000 barrels per day (kb/d). The grace period should provide European buyers of Iranian crude ample time to find replacement supplies, but challenging legal and financial obstacles are expected to wreak havoc for buyers, which could lead to supply dislocations and disruptions. At this early stage, it is still unclear whether European Union countries, China, and India will implement U.S. sanctions. The president’s decision was roundly condemned by Washington’s European partners in the Iran nuclear agreement, the Joint Comprehensive Plan of Action, who continue to support the JCPOA maintaining Iran remains in compliance. Tehran has vowed to continue to adhere to the agreement with its other signatories. Non-OECD Asian customers China and India, who account for around 50 percent of Iranian exports, are expected to continue buying supplies. Washington’s efforts to enforce its unilateral oil sanctions will be a much more difficult exercise than the multilateral measures implemented in 2012. The sharp reduction in Iranian exports, from an average of 2.5 mb/d to under 1 mb/d between 2012 and 2015, was largely due to the coordinated effort between Europe and the United States to impose stricter banking and shipping regulations on Iranian supplies. In particular, the EU’s implementation of draconian regulations on Iran’s shipping and banking sectors had the most significant impact on reducing exports. One major unintended consequence of the U.S. withdrawal from the JCPOA is the expected unraveling of the OPEC production agreement. The historic pact between OPEC and non-OPEC producers, led by Saudi Arabia and Russia, removed a combined 1.8 mb/d from markets since January 2017. The agreement has been extended twice, in May and December 2017, and is now scheduled to run until at least December 2018. Ministers will gather in Vienna June 20-22 to discuss the market outlook and future of the production agreement but the meeting promises to be more difficult following Washington’s withdrawal from the JCPOA. Whether Russia will agree to continue participating in the agreement given the punitive measures on its ally Iran is unclear. In any event, the expected reduction in Iranian oil production levels at the end of 2018 and in 2019 means that output targets and country allocations will need to be renegotiated. Saudi Arabia and others may argue that the group does not need to address the issue in June and seek more time to assess the impact. However, even if they opt to side step the issue now, a fundamental change in the parameters of the agreement will need to be addressed at the biannual November ministerial conference, if not before.